This object was among the more recent discoveries from our excavation at the site of the medieval and later Zouch Manor, Tidworth. The medal survives in excellent condition, though misses its ribbon attachment bar. The name of the medal’s original owner ‘J. W. Hanstock’, together with his service number (232654) and rank/regiment (a driver in the Royal horse artillery) is marked along the medals edge. The town of Tidworth has a long association with the British army and remains the home of the Royal Horse Artillery today. Over six million medals of this type were awarded after the end of the First World War to members of the armed forces who served overseas during the conflict. 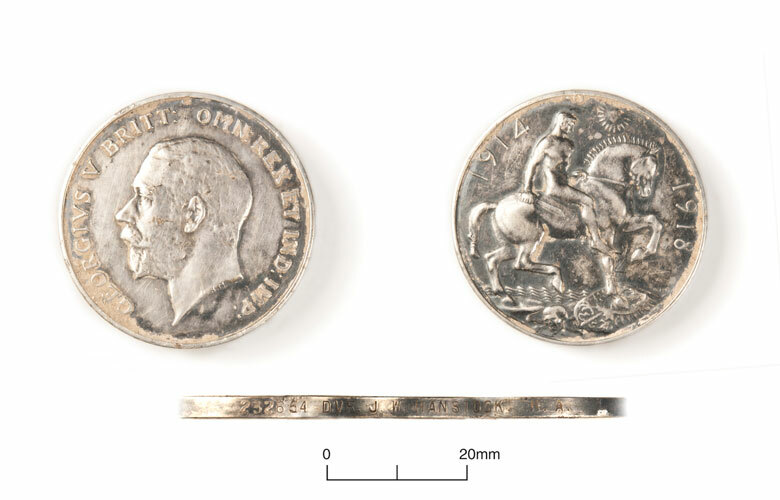 This example is an extremely rare and possibly unique find from an archaeological site and it seems particularly apposite that it was found in the year marking the centenary of the wars start. Little else is known so far about the medal’s original owner or how it came to be lost. The medal card, stored at the record office at Kew, records his Christian name as John. Many WW1 British army service records were destroyed during bombing in WW2, and no further information relating to this young man has come to light*. *Cotswold Archaeology would be interested to hear from anyone who thinks they may be related to John W. Hanstock or who has information about his life after the war.